I signed up for syndicated radio host (NPR) Lynne Rossetto Kasper’s weekly newsletter months ago. It is based on her show, “The Splendid Table” and includes at least one recipe each week. I’ve never made anything from it until now. I felt inspired by someone else to do something Asian-like. With noodles. Something cheap, easy and de-lish. Too much to ask for? 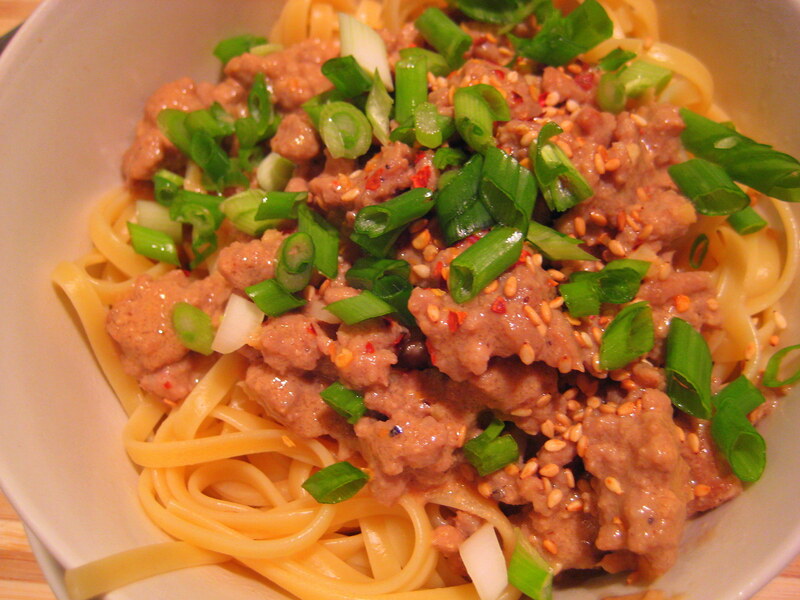 Lynne’s Spicy Sichuan Noodles with Ground Pork were some of the best Asian food I’ve made in a while. Ever? I’ve had a love-hate relationship with Asian food. I get the authentic cookbooks, shop at Asian markets in larger cities, so why doesn’t it ever taste like it does in the restaurant? The three of us dined and watched Wall-E. God I effing love that movie. Below is Lynne’s recipe. Central Oregon has pretty much no ethnic market, so I used linguine instead of Chinese noodles and dry cooking sherry instead of rice wine. I used some tahini (sesame paste) that I had from making hummus this summer — still good! I recommend sprinkling the dish with toasted sesame seeds and more chili flakes/slices at the end. Enjoy! Reprinted with permission from The Best of America’s Test Kitchen 2009: The Year’s Best Recipes, Equipment Reviews, and Tastings (America’s Test Kitchen, Brookline, MA, 2008). Copyright 2008 by the Editors at America’s Test Kitchen. For this recipe, we prefer fresh Chinese noodles with a width between linguine and fettuccine. If you are using Asian sesame paste that has a pourable rather than spreadable consistency, use only 1 cup of chicken broth. 1. Bring 6 quarts water to a boil in a large stockpot for the noodles. 2. Meanwhile, toss the pork with 1 tablespoon of the soy sauce, rice wine, and a pinch of pepper to combine and set aside. In a separate bowl, whisk the remaining 2 tablespoons soy sauce, oyster sauce, sesame paste, vinegar, and a pinch of pepper together until smooth, then whisk in the broth; set aside. 3. Heat the vegetable oil in a 12-inch skillet over high heat until shimmering. Add the pork mixture and cook, breaking up the meat with a wooden spoon, until the pork is in small, well-browned bits, about 5 minutes. Stir in the garlic, ginger, and pepper flakes and cook until fragrant, about 30 seconds. Stir in the broth mixture, bring to a boil, then reduce to a simmer over medium-low heat and cook until slightly thickened, about 3 minutes. Off the heat, stir in the sesame oil; cover and set aside. 4. While the sauce simmers, stir the noodles into the boiling water and cook, stirring constantly, until the noodles are tender, about 4 minutes for fresh noodles or 10 minutes for dried linguine. Drain the noodles, divide them among individual bowls, then ladle a portion of the sauce over the top. Sprinkle with the scallions, the bean sprouts and ground Sichuan peppercorns, if using, and serve. Many bottled Asian ingredients like oyster sauce and soy sauce keep for months when tightly sealed and refrigerated. Shop local Asian food markets for better quality for less money and certainly a broader variety than in supermarkets. Keep a selection of sauces and condiments on hand for seasoning and saucing quick stir-fries, and improvising your own Asian style dishes. I’ve mentioned it before but it bears repeating: there are two kinds of sesame oil. Dark Asian sesame oil is intensely flavored. Use it sparingly as a flavoring, not for cooking and, once opened, store it in the refrigerator. Lighter colored sesame oil has a mild, nutty flavor and is good in salad dressing. Its high smoke point makes it excellent for searing and high-heat stir-fries. Store this oil in a dark place at cool room temperature. When a recipe calls for fish sauce, the one I particularly like is Three Crabs Fish Sauce. It’s easy to spot in shops, and has just a hint of sweetness with an overall flavor that is less sharp than other brands. Find it in Asian groceries for between $3.00 and $4.50 for a bottle that will last you a year stored in the refrigerator. If it’s not to be had locally, order it online at www.importfood.com. This entry was posted in Uncategorized and tagged Asian, dinner. Bookmark the permalink. Pingback: | Cooking Tips | You’re online Cook Book, Video Recipe blogs. I also receive The Splendid Table e-newsletter, and have not made anything from it. This one sounds terrific, however, and I may have to give it a try. Thanks for the tip!